Tech Works FX Studios can design and build anything you need for your TV or Film Production, Theme park or Display needs. Why the "13" in the front of our name? 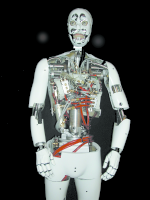 that represents the 13 skill sets we specialize in: Creatures, Robots, Animatronics, Custom Props, Special Makeup Effects, Animal Puppets, Design, Costumes, Custom Set Pieces, Stunt Weapons, Mechanical Fabrication, Displays, and Custom Installations. 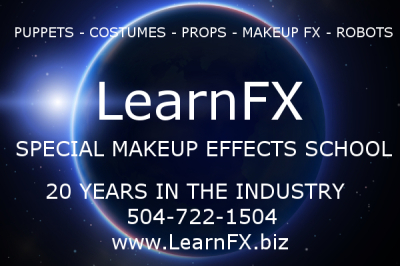 We have worked on films, commercials, TV shows, and themeparks and museums for almost 20 years from Los Angeles and now the New Orleans area and we service the world. We have a full shop with everything from a full machine shop and 3d printers department to a costume, make up effects and fabrication departments. We specialize in custom Props, Robots, Animatronics, Creature effects and Makeup FX, specialty Costumes, Set fabrication and more. We build just about anything and have works for everyone from Steven Spielberg to Disney and Marvel Studios. We have been in business in Los Angeles for almost 20 years and here in the Nola area for 4 years. We have learned from the greats like Stan Winston, Rick Baker and Greg Cannom as well as many others who are well known in our industry. We have worked on many things for movies, TV shows, museums and theme parks and so much more. If you need creatures or props for your installation or display, whether it's a themed ride or museum attraction, we do that too. It's a completely different animal (no pun intended) from production work and we understand that completely and can build exactly what you need. Displays or interactive animatronics for theme parks or museums need to work long hours, look great and keep the public excited. We understand, and we will give you the quality and attention to detail you require and ease of mind that our products will last for many years and function as intended.